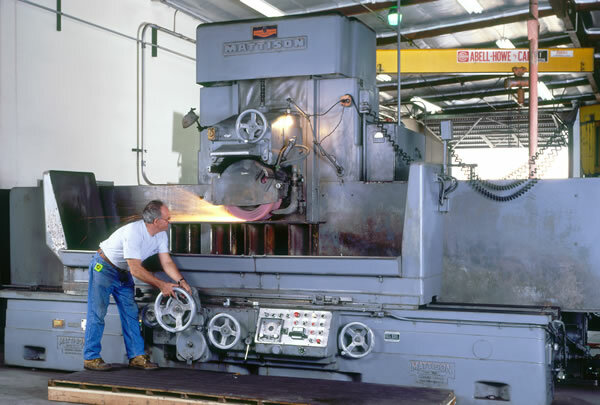 Recipricating Mattison Grinding is most often the finish operation on parts. Although the surface grinder is not a high stock removal machine, it is much more versatile and can achieve tolerances within tenths of thousandths and surface finishes finer than the Blanchard grinder can produce. On our 24" x 72" Mattison Grinder - Horizontal Spindle Surface we grind heat treated parts to finish dimensions, various size plates flat and parallel and to size within .0002-.0005. The surface grinder is ideal for shear blade sharpening, machined parts such as mold plates, stripper plates, die plates, sub plates, and bolster plates. Mattison Grinding is often used for general manufacturing and tool room requirements such as regrinding or reconditioning of worn machine surfaces. Again, we produce surface ground parts to incredibly close tolerances near .0002, and our production grinders along with our qualified machine operators allow us to grind these surfaces for you and get them right the first time. Spark out is a term used when precision values are sought and literally means, "Until the sparks are out (no more)." It involves passing the work piece under the wheel, without resetting the depth of cut, more than once and generally multiple times. This ensures that any inconsistencies in the machine or work piece are eliminated during Mattison Grinding. As with any grinding operation, the condition of the wheel is extremely important. Diamond dresser tools are used to maintain the condition of the wheel.